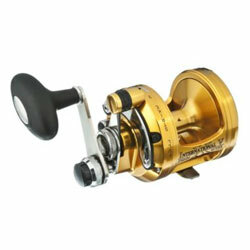 This classic Penn Jigmaster Reel still holds its own and is a superb choice for all-purpose 20-30 lb. class angling. Whether you're jigging iron for rockfish or live baiting for tuna, the Penn Jigmaster reel has already been there and done that. Live bait anglers love the Jigmaster for its high-speed retrieve and quick-take-apart frame, useful for changing spools when fishing conditions change. "I had one of these reels when I was a young man, and it worked great. Back then I purchased the reel becasue it was low cost and I had little extra money, now I have the money to purchase any reel and I went with my old frend, the Jigmaster." "This real is great its a perfect size for holding all day and i couldnt believe how much braid i could fit on it." "Good real. I might actually need the next larger size."